After the recent departure of the late President Jacob Zuma everybody seemed to be thinking that South Africa was moving towards a normalization of the state affairs. However, soon after Cyril Ramaphosa was elected as the fifth President of South Africa, the ANC started giving out mixed signals to the public, especially when talking about a possible land expropriation reform that would affect millions of white South Africans and further enhance the social and ethnic crisis that exists in this African state. In a shocking move that surprised everybody – including his supporters and opposition – President Cyril Ramaphosa has moved forward the process of amending the constitution as to allow for land expropriation without compensation in order to „address racial disparities in land ownership that persist more than two decades after apartheid’s demise in 1994”. This measure would affect a sizable part of the white population, which currently owns more than 70% of all farms in South Africa. Moreover, the ramifications of such an act would be immense – it would not only affect the South African economy, but it will also lead to food shortages, strikes and general civic disobedience. The ANC adopted the resolution in December as a move to counter the rise in polls of the far-left Economic Freedom Fighters (EFF), who made the idea of land redistribution their entire platform in the last couple of years. The South African Parliament backed the EFF motion last month, with a committee to report back to the chamber by August 30. 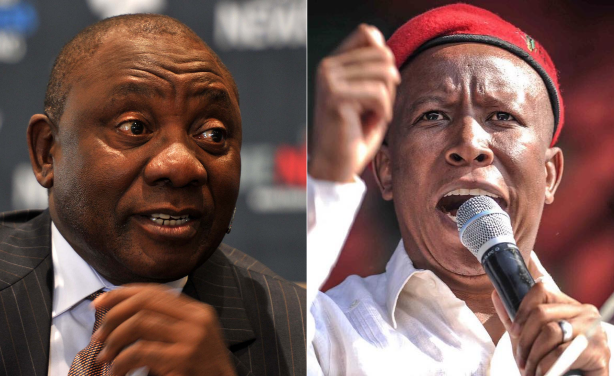 In order for the constitutional change to pass, a two-thirds majority needs to vote for it – and together, the ANC, the EFF and other small opposition parties will most likely have the necessary votes in order. So then – a tactical move made by the ANC to counter the rising EFF. It makes sense, given how the EFF has surged in the polls in the last couple of years, thanks in part to the energy of its controversial leader, Julius Malema. Not to mention the fact that given the bad situation of the economy, a lot of young people are unemployed and have virtually no job perspectives, further driving them to the radicalized EFF. The ANC either had to act now or risk on losing their seat of power in the next election cycle – and the best way to garner support in the eyes of the general public was that of approaching the land redistribution reform directly, with no remorse whatsoever. As analysts are making their plans for the 2019 election, the ANC naturally took the path of appealing the poorer black voters – the core of the ANC’s support – with Ramaphosa saying that “the issue of racial disparities in property ownership will be resolved once and for all”. The fight for the election has begun. Based on a survey conducted by the Government, only 4 percent of the private land is owned by blacks and only 8 percent of farmland has been transferred to black hands via redistribution with compensation programs initiated since the end of the white minority rule in 1994. On the other hand, AgriSA, a farm industry group, says 27 percent of farmland is currently in black hands – this figure includes state land and farm land. All in the meanwhile, the white population owns more than 70 percent of the farm land, mostly due to the continuity of the property ownership via inheritance. Many have pointed out to the strikingly similar situation that transpired in Zimbabwe, right after Rhodesia ceased to exist, where the seizure of white-owned farms under former President Robert Mugabe triggered an economic collapse, in large part due to most new farmers not knowing how to operate the farm equipment or not having enough capital to invest in the farm itself. This move did not only affect the economy (as agriculture was the backbone of the country), but the country also experienced a white-flight phenomenon, as the white population moved en masse to other countries, taking with them their investments and capital as well. Ramaphosa has said however that the policy would not affect the economy of South Africa, with ANC’s Masondo saying that “unused land will be the main target”. Still, the risks are substantial, as South Africa feeds itself and is the continent’s largest maize producer and the world’s second biggest exporter of citrus fruits. Even though agriculture accounts for less than 3 percent of the national output, it still employs more than 900.000 people, accounting for 5 percent of the workforce. A possible threat to production would also give way to food inflation, further hurting lower-income households. The World Bank has recently issued a report on South Africa in which they came to the conclusion that land redistribution is a vital component of a list that would see the country restart its economy. Furthermore, this move might prove paramount in the long-term, as millions of South Africans will be able to finally lift themselves up from poverty. However, the land reform the World Bank is talking about refers to the redistribution of 30% of the land, most of which is unused – if this is the case, then why is the South African government talking about a land reform centered around the “no compensation” paradigm? Whether the proposal to change the constitution passes or not, a sizable ripple effect has already rattled the South African society. A lot of the whites are concerned about their future and their land, which they have owned and worked on for decades. A lot of blacks are justifiably angry at the economic situation, with many being unemployed for years at a time, despite the fact that a lot of them now have access to higher education. And in the middle of it all, politicians are ready to play the race card once again, only to garner support from the poor electorate, ahead of an election that it seen as critical for the future of the country. If the proposal passes and the redistribution of land without compensation is enforced, the South Africa economy might experience a Zimbabwean-like scenario, and a testament of this can be seen when looking at the emerging ethnic conflicts between the whites and the blacks over the past few couple of month. Not only this, but it might also trigger a white-flight from South Africa to other countries which might accept the refugee status of the South African citizens (like Russia or Australia). If the proposal does not pass, the spark of conflict would still be there – and with many disenfranchised citizens, with no job prospects and a lot of time to waste, the situation might turn dire anyhow. We’ll have to wait and see – and hope that the South African politicians are ready to face what they have initiated. After all, it might be just another political move employed by the ruling ANC, just in time for next year’s election. We’ll be sure of it when we’ll have the final draft of the proposal in front of our faces.